Melissa Peeler is a trial lawyer specializing in medical practice, personal injury and employment law. Melissa’s practice also includes representing governments in litigation related to this country’s opioid epidemic. 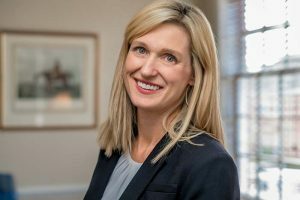 Prior to starting her plaintiff’s practice, Melissa practiced with a leading defense law firm in Atlanta, worked with a major medical center and served as a law clerk for a Superior Court judge. This variety of experience gives Melissa keen insight into what it takes to effectively and aggressively represent those seriously injured by the negligence of others. Melissa earned her undergraduate and law degree from the University of Georgia. In law school Melissa excelled on the Moot Court Board, earning honors as a first year law student and later serving as a coach on the Intrastate Team, and served as an associate editor on the Journal of Intellectual Property Law. Melissa, her husband and their three sons reside in Albany, Georgia, where they attend Porterfield United Methodist Church.